I like to wear perfume but not everyone else does. Each of us has a different tolerance level in terms of how much perfume we like to wear and how strong we want that perfume to be. For me, the bigger the better, but for lots of people perfume is less about making a statement and more about having a wearable comfort that does not intrude or take over. These types of perfume, the more subtle ones, have always existed in the form of light colognes but more recently, there has been a trend for almost anti-perfumes – fragrances that don’t follow a traditional structure and do not intrude into one’s personal space. Perhaps the most famous of these anti-perfumes is Escentric Molecules’ cult icon Molecule 01 which is simply one single aroma chemical diluted in alcohol. Because it is one material it does not smell like a perfume because it isn’t. It uses a material (ISO E Super) that is generally used in perfume compositions to smooth things out, so in isolation it smells like warm skin and woods, and floats above the skin without following the traditional trajectory of top, middle and base notes. There are many others though and the no-perfume perfume trend has born many intriguing twists on this theme. In today’s post, I want to showcase three perfumes for those out there who may want something completely subtle. The selection ranges from the modern anti-perfume to traditional perfume compositions that celebrate lightness. These are fragrances for people who want to smell good for themselves and not everyone else within a 10 mile radius, so if you’re someone who wants a subtle scent, you have come to the right place! Cartier have always balanced innovation and luxury in olfaction in a way that few other mainstream brands managed to do and Eau de Cartier feels innovative and luxurious in its lightness. Abstraction is the key here, with the characteristics of coriander, yuzu, bergamot, violet leaf, lavender, violet, cedar, patchouli, musk, and amber coming together to create something that smells greater than the sum of its parts. Eau de Cartier is fresh, slightly fuzzy and clean. It does not smell intrusive, instead it wears like a shawl made from the lightest cashmere. It adds weight to the old saying that you really can’t go wrong with a bit of Cartier. Juliette Has a Gun’s Not a Perfume is definitely not a perfume. When we think of perfume, we think of a mixture of ingredients – a composition blended together to create tension, surprise and pleasure. Not a Perfume is the antithesis of this because it reportedly only contains one material (although I’m sure there may be one or two other things thrown in for good measure): Ambroxan. This nifty little material (which is abstracted from clary sage) is the material responsible for the odour of ambergris, so it has a silvery, marine-like signature that is soft and sweet, with a mineral feel. The clever thing about Ambroxan is that it really brings lift to a fragrance and that’s what one gets a lot of with Not a Perfume – a soft, musky aura that floats almost indistinguishably above the skin. Is it really there? It might be. 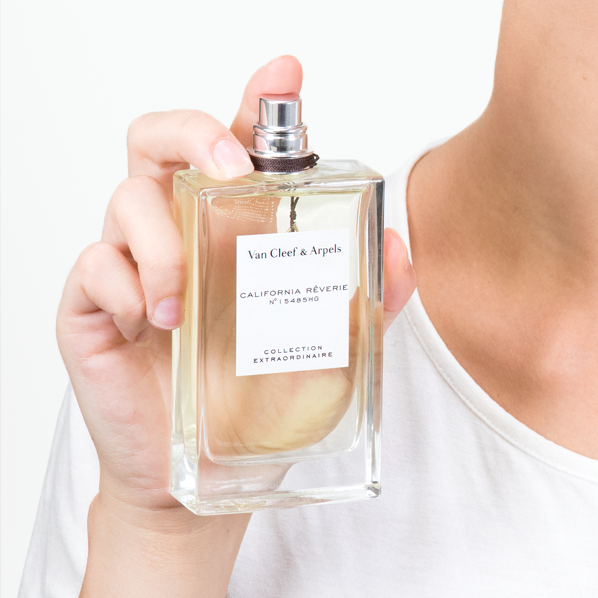 California Reverie is at the strongest end of our no-perfume perfume scale but it’s still wonderfully light and airy. Inspired by the Van Cleef & Arpels jewellery collection of the same name, this scent focuses on the heady note of jasmine, but instead of amping up the narcotic, indolic facets of this iconic flower, California Reverie instead presents the idea of the scent of jasmine blooms caught on a warm summer’s breeze. Neroli and mandarin lighten things with a cottony, musky feel and a subtle juiciness, whilst frangipani brings a touch of the tropical, all of this coming together to create a jasmine that is billowy and cool. California Reverie goes to show that even the heftiest of materials can be treated with tenderness in such a way that they almost melt into harmony on the skin. This entry was posted on Wednesday, July 25th, 2018 at 10:11 am and is filed under Candy Perfume Boy, Fragrance, Tried & Tested. You can follow any responses to this entry through the RSS 2.0 feed. You can skip to the end and leave a response. Pinging is currently not allowed.